You know, I’m reasonably technically savvy but for some reason I had a momentary lapse and forgot how to rotate photos on my phone. So, for those of you who subscribe to my blog (all twenty of you! ), I apologize that you’re getting this twice. I couldn’t stand not fixing this photo. The tree is lovely and my coworkers worked too hard creating it. 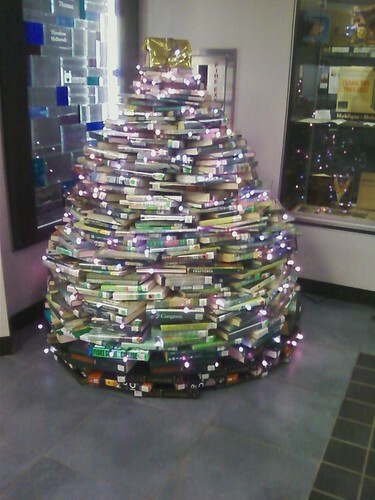 This entry was posted in Rave, Reading and tagged Book Christmas tree, Christmas, Christmas decorations, Christmas tree, Library book Christmas tree. Bookmark the permalink. How wonderful! You guys did a great job. How long did it take you? While I’d like to claim to have had something to do with it, I didn’t. Two co-workers made it. And it was up and lit within a couple of hours, I believe. Isn’t it beautiful?